We believe every employee shares in the responsibility for promoting a positive workplace and making a commitment to Doing What’s Right. High standards are more than a slogan or catch phrase - they represent the way we do business. Maintaining high standards means conducting business ethically and legally. Adhering to these standards helps us protect the reputation for excellence and integrity that we’ve built as an organization. If you see or suspect unethical or illegal activity, report it immediately. While speaking directly to a manager or supervisor may be the most effective way to report your concerns, Argonne also offers another option for Doing What’s Right. We have retained the services of Navex Global, an independent reporting service that allows you to communicate via the Internet or by telephone, 24 hours a day, 7 days a week. You may even communicate anonymously if you choose. Speak Up! 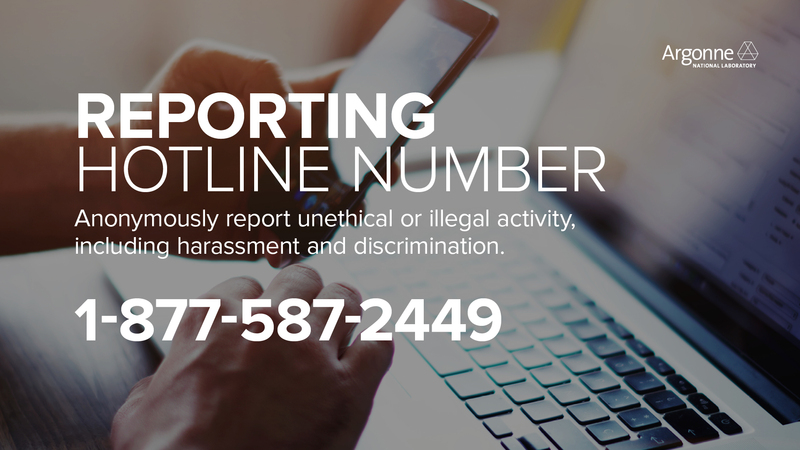 If you see or suspect unethical or illegal behavior, you may report your concerns by contacting The Hotline. Upon receipt of a report, The Hotline will forward the information to Argonne’s Legal Department for investigation and follow up. Retaliation of any kind against anyone who reports a concern is a violation of Argonne’s principles and will not be tolerated.